home → Loans → Car Loans → How Long Should the Term for a Used Car Loan Be? How Long Should the Term for a Used Car Loan Be? It is not wise to elect a 72 month used car loan. The long loan term on a used car will often lead to an upside down loan situation. While the longer length may be safe for a new car, a used car's value will depreciate too quickly to make this a viable option. Where possible, it is better to aim for a 36 to 48 month used car loan. Cars depreciate in value very quickly. During the first few years or 50,000 miles of use, the car's value depreciates a relatively small amount. However, once a car is past this threshold, the rate of depreciation accelerates. The car will be losing a large portion of its value each year, meaning the asset actually shrinks the longer it is held by its owner. A used car may already be nearing the 50,000 mile mark when it is purchased. This means it will depreciate faster than a car purchased new. Other assets, such as homes and jewelry, actually increase in value over time. Taking long loans on assets that appreciate is not as risky. 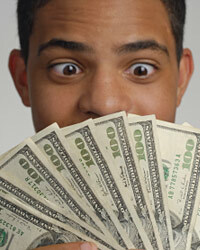 Long loans offer lower monthly payments. For example, repaying an $8,000 loan in three years may cost as much as $250 to 300 a month. On the other hand, repaying the same loan in 7 years will cost as little as $120 to 150 dollars a month, depending on interest rate. While it may seem attractive to opt for a low monthly payment, you will build equity much slower. After 1 year of paying the long loan, you will have built less than $1,500 in equity. In the shorter loan, you will have built over $3,000 of equity in the same period of time. Building equity quickly helps keep you out of an upside down loan. In the long loan example, you own only $1,500 plus your monthly payment after one year. If your payment was $2,000, then you own only $3,500 and still owe about $7,000 to $7,500 depending on interest rate. If the car's value has depreciated $3,000 from its original $10,000 purchase price, you may actually owe more on the loan than the car is currently worth. If you were to sell the car, you would have to come up with extra cash in order to repay the debt. The car will also count as a negative asset on your balance sheets, lowering your credit. This is particularly risky because most car loans have recourse debt obligations. With a recourse loan, you will owe the difference in the car's value and the total debt owed if you default on the loan. A lender will repossess your car after default. The lender will then sell, or liquidate, the car to cover your debt obligation. If this sum is not enough to cover the remaining sum owed, you will have to fork over additional cash even though you can no longer use the asset and will benefit in no way from the additional payment.